Sarah Palin Resigns as Governor of Alaska – For 2012 Presidential Run? Robert DeBerry/The Mat-Su Valley Frontiersman, via Associated Press Sarah Palin at the news conference on Friday. Palin resigns as governor, leaves plans secret: Alaska Gov. Sarah Palin surprised supporters Friday and announced she is resigning from office at the end of the month, leaving open the possibility she would seek a run for the White House in 2012…. In a hastily arranged news conference at her home in suburban Wasilla, Palin said she will formally step down July 26, and Lt. Gov. Sean Parnell will be inaugurated at the governor’s picnic in Fairbanks. She said she had decided against running for re-election as Alaska’s governor, and believed it was best to leave office even though she had two years left to her term. Prepping for a run for president? 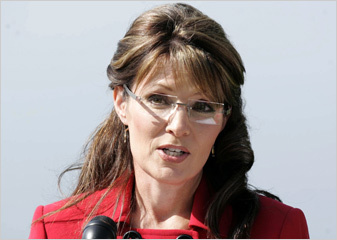 Howard Fineman: Palin is potentially a major GOP player in 2012 race: I have covered politics for a long time. I can tell when someone is running for president. Sarah Palin is running for president. On a sunny (slow news) day in Wasilla, Alaska, the governor and former GOP vice presidential candidate appeared before the cameras and announced that she was stepping down as the state’s chief executive 18 months before her term expires. Palin’s Resignation: Shrewd Move or Political Suicide? : Alaska Gov. Sarah Palin’s decision to not only opt out of running for re-election but to resign as governor at the end of the month underscored the Republican lawmaker’s commitment to “no more conventional politics as usual,” as she said today in her announcement. But if Palin is serious about a 2012 presidential bid against President Barack Obama, how smart of a decision was it to bow out of the only public office she’s ever been elected to before the end of her first term? Palin Announces No Second Term: I’ve never believed that I, nor anyone else, needs a title to do this – to make a difference… to HELP people. So I choose, for my State and my family, more “freedom” to progress, all the way around… so that Alaska may progress… I will not seek re-election as Governor. But I have given my reasons… no more “politics as usual” and I am taking my fight for what’s right – for Alaska – in a new direction….